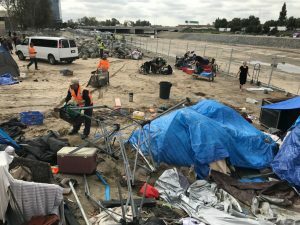 Homeless encampments are becoming more prevelant in California. In this Special Edition Episode we look at the clean up operations that are undertaken and how to stay safe. This includes the requirements for recycling as well as PPE. In the image below, this cleanup crew is not properly attired or protected with PPE. Listen to the episode for our full conversation! Keep an eye out for our new podcast mini-series “THIS IS MY NO” COMING SOON! Like what you hear? Be sure to Subscribe! Your 5 Star ⭐️⭐️⭐️⭐️⭐️ Reviews help us get the word out about our show!